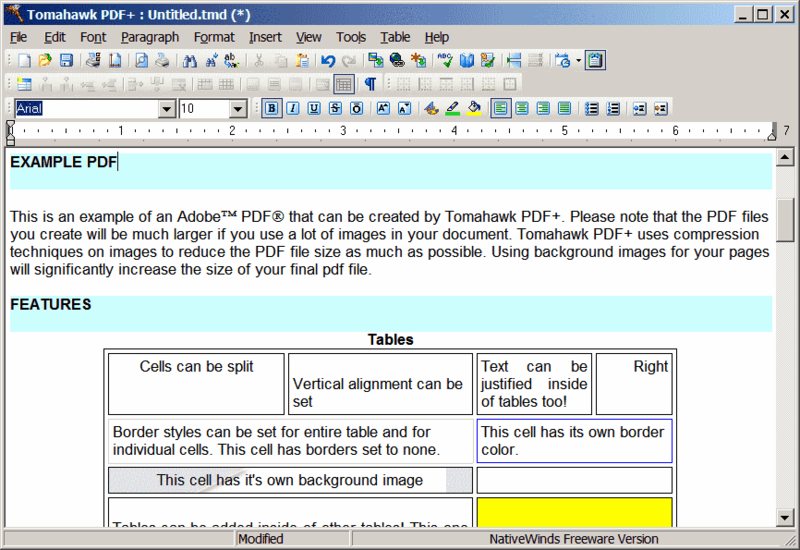 Tomahawk is a full-featured word processor for RTF, TXT and other file formats. It includes tables, search and replace, HTML links, and drag-and-drop support for images. As the name implies, the program can import PDF files as well as export images and text from PDF files. Available dictionary and thesaurus available from the website. NOTE: the website has gone offline, mirrors available. Yep, but download links still work (not for long?). The website has been shut down. Created PDF with Table, and end product resulted in far right of table not shown on PDF even though I justified it to center. Tested this program to make PDF, works great. Tested spell checker it failed! Spell checker checks EVERY WORD, not just misspelled words! It can't open a " (quotation mark).....why??? Doesn't work under 98SE. I doubt it works under W95 either. Looks great. MS Wordpad broke the association with rtf documents and some others on the machine a while ago - doesn't open if I click on the paper, though the program si still installed - so I needed soemthing to act as a good stand-in, but Tomahawk clearly does more than handle the Wordpad formats. But Tommy does much more than that! It doas support MS Office files, you just have to import them. Nice program, but with no supporting of tabs: if you have several files open, without tabs, is a mess. Does not support MS Word files. A major draw back for me. I got rid of all the word processors on my USB and replaced them with TomaHawk. Excellent program. Regarding OpenOffice - um, size of TomaHawk can't be beat! Does it do something OpenOffice can't? A welcome addition to the collection, particularly with its ability to handle tables. Seems to work well and is fast loading from a USB flash drive too.